She wasn’t there. That’s just the way it was. Sandelina was not on the bed. She was not even under the bed. Old Grumbler was there, and the really old Teddy. Teddy was kind of broken though, a little bit blind and deaf and hairless. He had been a good teddy for the longest time, until he started loosing bits and pieces of himself. After that, he started looking at Chrissie a bit loopy-eared and squinty-eyed. Teddies can look a little bit mean when they drop pieces of themselves. But Teddy never looked mean even after losing one eye and other bits. He looked sad. Chrissie didn’t like sad toys. Anyways, old Teddy could stay under the bed where he couldn’t look at her so squinty-eyed and sad. And Grumbler could stay there too. They could sit under the bed with Chrissies busted up book about blue balls and green houses. Because houses weren’t green, not for real, and Chrissie was too old for baby books anyways. Grumbler and Old Teddy could learn about green houses and purple buckets; what a silly thing, buckets weren’t purple. She guessed that maybe they could be; there were red buckets and blue buckets after all. But Chrissie had never seen a purple bucket so she didn’t quite believe there were any. There were bunnies under the bed too. That was another silly thing. They were just pieces of hair and soft stuff, sometimes little pieces of other things like paper or dirt and grass, but Chrissie knew that real bunnies had legs and a head and a tiny fluffy tail. No dust bunny Chrissie had ever picked apart had any of those. They were just kind of long and almost round, made up of all the things the vacuum cleaner didn’t find. Dust bunnies. Mommy really was silly sometimes. But she still couldn’t find Sandelina. Not in the plastic toy box, not under the blankets. She was definitely not on the window sill chatting away with Porky, Tuft-tuft, or Tiny Evelina-Bob. Sometimes Sandelina crawled into the corner behind the big closet, but she wasn’t there either. Chrissie thought hard and long. After looking through everything she could think of, even inside the closet although Sandelina would never go there, she went out on the landing outside her room and even looked on the floor there. No Sandelina. Chrissie scrunched up her face and scratched her head with one stiff finger. “Hm.” She stepped over to the table where the upstairs phone stood, surrounded by all kinds of letters, and papers, and pads and pens, and all that stuff that Chrissie wasn’t allowed to even think about thinking about drawing on with her crayons. But no one could stop Chrissie from thinking about something. A little bit of thinking never hurt. She didn’t always have to do what she was thinking about doing, right? Well, she wouldn’t draw on the important papers and letters. Again. She dropped down on her knees and looked under the table. There was a space there, a dark little corner between the table and a big plant that Chrissie wasn’t allowed to touch. Or eat. She wouldn’t do that either. Not ever again. Sandelina was not in the dark space where she could have been. Sandelina was really good at hiding. She scratched her head again and shrugged. It couldn’t be helped; this was a problem she couldn’t fix. She bounded down the stairs with one hand hovering above the round wooden railing. She didn’t need to hold it anymore, Chrissie had good balance. Mommy even said so. She bypassed the last step at the bottom with an elegant hop and pin wheeled only a little at landing. She walked through the hall and into the living room. Mommy sat on the big sofa with papers all over her legs, a pen in her mouth and the sparkling new glasses almost all the way down on the tip of her nose. The pen wiggled back and forth and papers rustled. Mom took the pen out of her mouth and scribbled something on one of the papers, and then she put the pen back and started moving papers around again. “Mommy?” Chrissie knew that mommy was working and didn’t really have time to talk. But it was an emergency. And if anyone had answers to everything… well, almost everything, it would be mommy. “Uh huh.” Mommy didn’t look up, but she was listening, kind of. “I can’t find Sandelina. I think she ran away.” Chrissie stated her case decidedly and made sure to speak every word carefully, putting just a little bit of emphasis on the running away part. She nodded slowly and wrinkled her forehead to emphasize the seriousness of the situation. “Again?” Mommy mumbled in that far away way that meant she wasn’t quite listening. Chrissie nodded but it would feel like forever. It wasn’t like Sandelina to be gone just like that. Chrissie sighed but looking for Sandelina was better than not looking for Sandelina. She started with the closest room, the kitchen. But there was no way Sandelina would go there. Maybe she had followed Chrissie there for breakfast. She dropped down on all fours and crawled under the kitchen table. She didn’t really have to do that, but making sure Sandelina wasn’t on any of the chairs was easier that way. There were no dust bunnies under the kitchen table, but she found three dried macaroni spirals, a pink hair band, a piece of Barbie, and only one chair had anything sitting on it; a big crooked pile of more papers. She put the little piece of Barbie in a pocket along with the hair band and the three macaroni spirals. She flopped down on her tummy and looked out from under the table, through all the chairs. She could count all the chairs, if they weren’t more than ten, but she thought there were more than ten legs, almost like a cage, but she could escape. It was easy. She crawled out on the floor proper and looked back at the wicked cage that had tried to catch her and maybe eat her too. She looked around the entire floor by way of sliding around on her tummy, head up, kicking feet and pulling with flat palms until she had made a full circle. She made another circle just to be sure, but Sandelina was not on the kitchen floor. Chrissie stood up and scanned all the counters and flipped the lid up on the garbage bin. “Ew!” Whatever was in the garbage made her nose crinkle up and tickle. She pinched her nose and peeked down at the nasty. “Ew!” She said again. No Sandelina, but why was there a pink sock in there? It lay jammed under an empty jar of icky stuff. She tilted her head and leaned a little bit closer. There was nothing wrong with that sock. She put a finger on the fluffy pink fabric, and then she saw another one. It was one of Daddy’s; black and not soft at all, not like Chrissie’s socks, and it had holes everywhere. She giggled and let go of her nose. “Ew! Extra eeeew!” She said and closed the garbage bin. She looked around one last time before returning upstairs. She bypassed the door to her room and pushed open the next one. She stepped through and looked around. It smelled a bit funny in there; something that kind of tickled her nostrils but not quite. More like burning. Like when mommy cleaned windows. She looked at the little table next to mommy’s big mirror. “Don’t touch anything.” She remembered mommy saying. With a final longing look at all the different bottles and pretty boxes, she looked away from the crowded table. There wasn’t any room for Sandelina to sit there anyways. And Sandelina was definitely not allowed to look in the drawer either. Absolutely no way. Chrissie sighed. “Hm.” Sandelina was absolutely positively not on mommy’s bed. It wasn’t very hard to see, because there was nothing at all on it. Mommy and Daddy’s big fat bed was naked. It really was naked. The big fluffy comforter was gone. So were the sheets. The mattress was still on the bed, but it didn’t look comfortable at all. The pillows were gone too, but she found them piled up on the fancy dresser in the corner. They were naked too. They were all white, but they had been blue, Chrissie thought. Blue and silky, with ribbons all around the edges. Chrissie liked the ribbons and picked on them sometimes when nobody watched. But the blue silky pillow cases were all gone. But if Sandelina wasn’t in the bed… She dropped to her knees and looked under the bed. Funny. Mommy didn’t have any pretend bunnies under her bed. None at all. No Sandelina. She lay down on her back and slid under the bed. She looked up at the wooden boards that held the mattress up. They looked naked too. She slid around on her back, watching the world turn all wrong. It felt funny, so she made another sliding turn and giggled and sneezed. She slid around another half turn and wriggled her way out head first. She lay absolutely still on the floor, turned her head this way and that; maybe Sandelina was under the dresser. Nope, clearly not there. Her searching gaze fell on the pile of pillows on top of the dresser. Was Sandelina stacked with the pillows and lost? The pillows; three big and two small. That made five. One by one, Chrissie moved them to the floor. She turned them and patted them to make sure there was nothing hiding in or between them. When all the pillows had been searched and lined up on the floor next to the dresser, Chrissie flopped down on top of them to think for a minute or two. Where was Sandelina? When had she last seen her? It was so hard to remember. Mommy always told her to think and to concentrate; then it would come to her. But that was so silly. Things didn’t just come to her when she thought about them. That was kind of magic, and Chrissie had tried, actually tried really really hard. Magic wasn’t real at all. Chrissie hated to try to remember when there wasn’t anything to remember. But maybe she could figure it out if she thought really really hard. Chrissie frowned. Laundry? She looked at the naked bed, dug the back of her head into one of the naked pillows, and looked up at a very naked window. Chrissie climbed out of the mountain of fluffy nakedness and strolled out of mommy’s bedroom and down the stairs. She avoided the last step again and made a marvelous landing in almost perfect balanced fashion. But instead of turning left after the stairs, she turned right and spent a few moments in the laundry room. She hop-skipped to the living-room and flopped down on the couch next to mommy, humming under her breath. It was a melody she and Sandelina had made up yesterday. It was just before Chrissies doll tried to dance on the kitchen table, tripped, and fell face first into Daddy’s macaroni spirals. So Mommy had sighed and taken the sticky doll by the hair and said. “I think Sandelina can help me wash curtains and pillowcases tomorrow then. It will do her good.” Sandelina had been gone ever since. Chrissie had forgotten, but now she knew. Sandelina was nice and clean now and had finished tumbling around and around, maybe she was still a little bit warm and dizzy. Chrissie cringed a little. It didn’t go quite the way she had thought it would. But it was alright. Mommy wasn’t angry, even if she had that way of wrinkling her forehead and not blink for a long, long time. Mommy curled up her eyebrows and twitched her lips a little as she considered the deal. Finally she sighed, shuffled her important papers a little bit, and looked back at her daughter. “Sandelina, silly.” Chrissie said quickly. “Supper?” If possible, mommy’s face crinkled up even more. Chrissie nodded. “Yep. Supper yesterday.“ She pressed her lips together and zipped them shut with a finger. It was hard to giggle with the mouth closed though. Really hard. And mommy looked so funny the giggle would explode any second. She squirmed and rocked back and forth, swallowing giggle after giggle until her tummy felt all wobbly and warm. And mommy’s body didn’t move at all when her eyes and mouth went here and there, and she chewed her lip so hard Chrissie was afraid mommy would bite it off. “Oh sh—” Mommy’s eyes flew wide open and she clapped a hand over her mouth. Then she hopped off the couch and disappeared into the laundry room. When mommy came back a moment later, she smiled that pretty mommy smile. 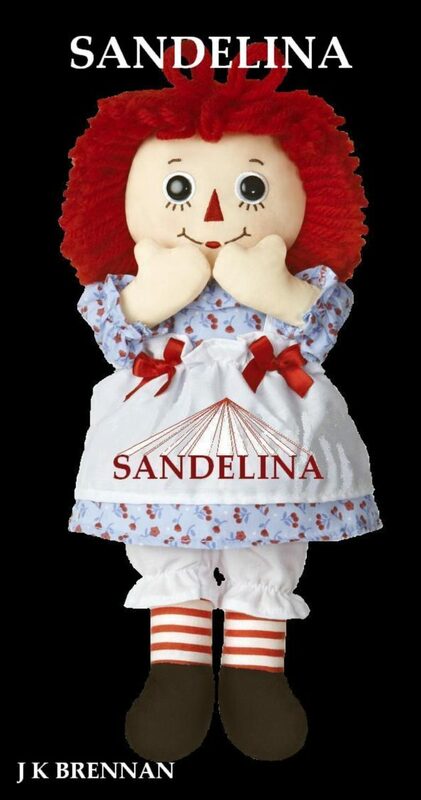 “Sandelina,” she said to the doll, “I’m sorry I forgot you in the dryer.” Sandelina just smiled as she lay in mommy’s arms. Chrissie reached and Sandelina came to her. Previous PostPrevious Why blog? Continued weed whacking in search of specifics.